“I think this expansion of government by 400,000 to 500,000 new people that are depending on the government for health care is more nauseating than probably just about any tax increase that we can put forth simply because it is an entitlement we are not going to be able to be rein in,” Republican Michigan State Senator Joe Hune. State Sen. Joe Hune called the likely expansion of Medicaid to Michigan’s working poor “garbage” he “could not stomach” to support in Tuesday’s Senate vote that narrowly passed the measure. First term State Senator Joe Hune voted ‘yea’ for life time healthcare insurance in 2012 without contribution for present Senators. “It’s kinda like we had this really big dinner. We got the dinner done and now some people are asking for dessert. We’re going to skip dessert on this one and move forward.” Senate Majority Leader Randy RICHARDVILLE (R-Monroe) on his chamber’s decision not to take a revote on immediate effect on the Medicaid expansion bill. The delay in implementation will cost the State of Michigan ~$600 million in Federal Aid for the Medicaid Expansion. The Medicaid expansion will not happen till April 1, 2014 as a result of the Republicans sulking. Last week Georgia’s Insurance Commissioner proudly came out as an Obamacare obstructionist, bragging that Georgia would require “navigators” – people hired to assist individuals sign up for Obamacare — to be licensed by the Georgia Department of Insurance. According to investigative reporter Jim Walls of Atlanta Unfiltered, the PAC hasn’t filed taxes or the required financial disclosures in two years, and the information it did file for 2011 was incorrect. Contributors to Real PAC include Aetna, Humana, Blue Cross, United Health care and other interests that want to keep health insurance premiums and other costs as high as possible. Bryan Long of activist group Better Georgia told Raw Story that the list of donors shows who Gov. Deal really works for. Let’s also pay attention to the Big Donors here: United Health, Aetna, Humana and Blue Cross. United Health and Aetna have declined to participate in state-based exchanges in states where they’re actually regulatedlike California and New York, opting instead to hand off some payola to a corrupt Georgia governor in order for him to behave like an obstructionist. Bill Clinton has become the The Secretary of Explaining Stuff for the PPACA. Maggie goes on to explain to one writer why the Kaiser Calculator is out of date as the Healthcare Exchanges come on line with real pricing. The Kaiser Foundation Calculator is out of date. They created it before any of the states had announced rates. So they were not able to accurately calculate subsidies because subsidies are based on the actual cost of the 2nd least expensive Silver plan in any given market. You have to know what that premium is to figure out the subsidy. In addition, they are using their estimates of “national averages” as to what a Bronze or Silver plan will cost a person of a certain age with a certain income. Now that many states have announced actual rates, we are finding that they are significantly lower than expected. In New York City (the most expensive insurance market in the nation for young people because we don’t let insurers charge older people more), he would receive a subsidy of $2190 (because the benchmark silver plan that determines the subsidy is quite expensive. He could then take that $2190 subsidy and purchase a Bronze plan for $1506 a year. Can he afford $1506? Yes. Bob, I think you’re out-of-touch with how well a 30-year-old who earns $30,000 a year is doing. He earns more than roughly 70% of Americans in his cohort ( 21-30) You’re looking at $30,000 a year from the perspective of a 40-something. A 30-year-old male with that income is likely to be single and living in an urban area where he spends far less on rent/mortgage than a 40-year old would (I know this because my kids are roughly that age, one in NYC). He probably lives in a small apt. in a part of the city that is not a middle-class family neighborhood. His neighborhood is more commercial, surrounded by bars and restaurants with a decent night life (this is where he wants to be and very likely he shares the apt with someone [a girlfriend]). That cuts his rent in half. Depending on the city he lives in and the public transportation, he may or may not need a car. (A 40-year old with kids does) The 30-year-old earning $30,000 spends much of his paycheck on eating out, ordering in, etc. He’s not yet worried about saving–he spends most of his paycheck every month. This is why he can afford to spend $100 to $132 a month for health insurance in two of the most expensive cities in the nation. He no doubt spends well more than that each month for beer, pizza, drinks with friends at local bars, and ordering in junk food. If he cooked dinner 1 or 2 nights a week, he could save enough to cover the premium (This is just one of many ways to economize–my point is only that he can afford $100 a month.) . Students Screwed Again by Congress ? ? ? Since I have worked with students filling out FAFSA forms for grant, subsidized and unsubsidized loan eligibility, etc. ; I have an interest in how the interest rate debate shook out. As you know, the Senate reached a bi-partisan agreement in the smoked filled backrooms to which the House agreed to in a follow-up vote. You would think there had never been any partisanship amongst either party from reading some of the remarks made by the Senate-buds. 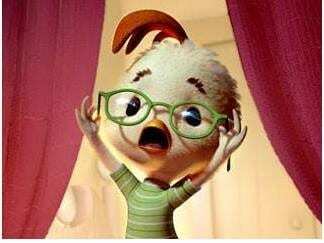 Anytime Cantor, Boehner, and Ryan get excited about a Senate decision, you know something is coming down the hill which is not going to be good for us. If you have bothered to read some of the media comments and blog articles (more on these later), allegedly there really is not much difference in what results from minimal interest rates changes. There is some truth to this when looking at monthly payments as the difference is usually small. I always like to look at the amortization table and total cost of the loan to make a decision. Eventually though, a dollar here and a dollar there and pretty soon you are talking about $thousands which does make a difference for students and parents. Undergraduate loan are now capped at 8.25% and Parent Plus Loans are capped at 10.5%. The agreement reached managed to save students some money in the beginning before it reverts to true rates agreed upon. The loans will be tied to a 10-year Treasury Bill rate with a 2.05% premium added to it. When they agreed to the new policy, the TB rate was 1.9%. I looked today to see it had gone to 2.4%, which means the next set of borrowers (if this stays there) will pay more than this year’s borrowers will for new and consecutive year loans. Much of the argument leading up to this bill precipitated from a lack of agreement on how to value the loans going into the future. The Republicans were looking to use Fair Value Accounting Estimates to account for risk and the Democrats were resisting such a move preferring to stay with the historical data collected by the Department of Education (which it will not release) to ascertain risk. Student advocate Alan Collinge points out, the usage of historical data is a worthwhile approach since there are reams of accurate federal data for Federal Students Loans. For some reason, the CBO does not wish to use this data this year and instead turns to commercial bank data (Fair Value Accounting) for student loans. Loans granted by commercial banks typically have higher interest rates, are riskier, and have fewer of the guarantees or collection powers associated with Federal loans. Resulting from this switch in data, the CBO’s estimates into the future changed dramatically, going from turning a surplus of $45 billion into a loss of $11 billion for federal student loans issued in 2013. Over the time I have been involved with student loans, the commercial lenders have always whined about the government’s Direct Loan having an advantage over them in making student loans. Partially this is a true statement and I have found them easier in which to work. with that being said I will stop here and let you read a part of the discussion between Alan Collinge of StudentLoanJustice.org and Forbes contributor Peter J. Riley “Intervew with Student Loan Activist Allan Collinge – Fair Value in An Unfair System?” on why not to use Fair Value Accounting for student loans. AC: DC based think tanks including the Heritage Foundation (Jason Richwine), the New America Foundation (Jason Delisle), and others are expending significant efforts currently to legitimize the use of so-called “fair value accounting” for establishing budgetary costs of the federal student loan program. These efforts largely rely upon recent and compelling work by the Congressional Budget Office to compare historical accounting cost estimates for federal student loans with fair value estimates. While there are some questions about the appropriateness of FVA for valuing assets on the government books, for the purposes of this discussion, we’ll ignore them. As such, the method, which discounts the value of a lending instrument based on future risk projections, is a worthwhile approach in principle, and the CBO’s cost estimates change dramatically as a result of employing it-turning a surplus of $45 billion into a loss of $11 billion for federal student loans and guarantees that were issued in 2013. One has to be impressed with the dramatic increase in cost that this model predicts for federal student loans. Equally impressive is the extent to which Delisle defends this method (See here, here, and here) and the passion Richwine exudes as he condemns big-government for using such an “accounting trick” to hide the true costs of the program. Upon cursory examination, however, it becomes obvious that the method being championed by these two analysts-even by Fair Value Principles is blatantly inappropriate, uses grossly and demonstrably incorrect inputs on at least two fronts, and generates unbelievable results that even laymen with no particular accounting expertise would likely reject out of hand. Harsh characterizations, I realize, but certainly not thrown up lightly. PR: How are FVA accounting principles being violated? AC: In evaluating the value of a lending asset, Fair Value Accounting principles require, first, that actual, historical market data on sales of similar assets be used as a benchmark for determining the fair value assets if available. For federal student loans, such data exists, since federal loans have been securitized and traded for years, and except for a brief period following the financial crisis in 2008, the market has been active, healthy, and relatively stable. Therefore, any competent fair value accountant would and should use this data as the primary benchmark, and look no further. The CBO, however, does not do this! The CBO, Delisle, Richwine, et. al choose to ignore federal loan sales data, and instead choose private loans as their relevant benchmark. These loans have much higher interest rates, are far riskier, come with none of the guarantees or collection powers attached to federal loans, and the private student loan market is far smaller (less than a fifth the size of the federal market), more volatile, and far more difficult to find reliable data on generally (private lenders tend to consider data like default rates, collection costs, recovery rates, and so forth as proprietary). Based upon this, there should be no disagreement that private loans are ill suited for valuation of federal loans. What is worse, however: The private loan market has always been highly dependent upon the federal loan system in many ways. One example: many if not most borrowers turn to private loans only as a last resort because they could not get federal loans. The lenders know this well, and raise their prices accordingly. There are other dependencies, but this alone should disqualify private loans from serious consideration as benchmarks for valuing federal loans. For these reasons, it should be overwhelmingly clear that the private lending market is grossly inappropriate for use as a pricing benchmark for federal student loans. In fact, I cannot imagine that any competent analyst would attempt to use private loans as a stand in…even as a poor second choice. PR: Don’t you agree that taking in the future cost of defaults is an appropriate thing to do? This seems to be the thrust of why fair value accounting is being promoted. AC: Again, thanks for asking! Delisle points to the cost of defaults as a critical reason for using fair value, but years of presidential budget data show that for defaulted FFELP loans, the government’s recovery rate is 122%, a rate far higher than any loan, public or private could ever claim (this is directly attributable to unprecedented collection powers, and the removal of bankruptcy and other protections). For Direct loans, this rate has been about 110%, but I estimate that with FFELP ended, this rate is about 115% . Even discounting generously for collection costs (using cost data for generalized bank loans which typically involve seizure of property, significant court costs, etc. ), and factoring in the government’s cost of money leaves a hefty profit on defaults, and in fact shows that the government makes more money on defaults than loans which remain in good stead (a defining hallmark of a predatory lending system). But Delisle points to the same, flawed “fair value” costing reasoning to claim that in fact the government loses money on defaults. This is analogous to Exxon pointing to a guy selling biodiesel out of his garage for $8/gallon, and using this to justify writing off $4 for every gallon the corporation sells. The “costs” are not only completely fictitious, there is ZERO chance that they will ever occur based on all available data. PR: So, what are the implications of all this, Alan? AC: A governmental entity having a preference for its loans to default is something like the epitome of bad governance, and explains well the Department of Education’s reluctance to crack the whip on the schools to contain their costs, warn the public about the true risk they are taking, or advise congress to decrease federal lending limits. Certainly the Department’s institutional budget has soared under these conditions as well. 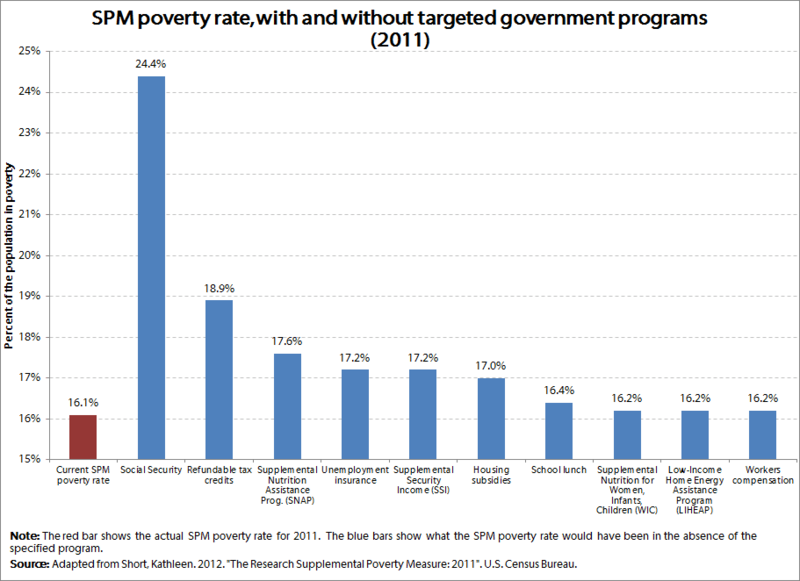 This makes it both bad government, and big government. The New America Foundation used to do meaningful work pushing for good government, yet here their expert is protecting just the opposite. Similarly, the Heritage foundation has historically championed smaller government, but their staff protects its growth here, whether wittingly or not. Delisle, if not Richwine, has published voluminously and in great detail on the general concept, but for all his analysis, has never explained or even acknowledged the departure from sound FVA principles. I think he really must in the public interest, and frankly, in the interest of preserving the integrity of his professional reputation, if nothing else. There are serious policy considerations as well. For example: If this methodology is accepted and used by Congress in its decision making, then we’ll have a “tail wagging the dog” scenario where the private lending industry will be able to make the federal program “look” far, far more expensive by simply raising their interest rates! While this is something the private lenders like Sallie Mae clearly would like to do for a number of reasons, it threatens millions of borrowers, the federal lending system and the public interest generally. PR: So, eventually, the real facts about default recovery should catch up to this method over time, right? Doesn’t this allay your concerns? AC: We don’t have 3-4 years to let this sort of dishonest accounting fraud prove itself as such. Google “Enron” and “Fair Value Accounting”, and you will understand the urgency of my concern. 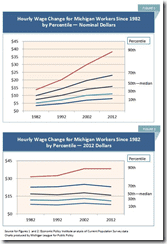 Each year the Michigan League for Public Policy issues a Labor Day report on the status of Labor with in the state. This year the outcome for Michigan Labor is no better than in previous years. 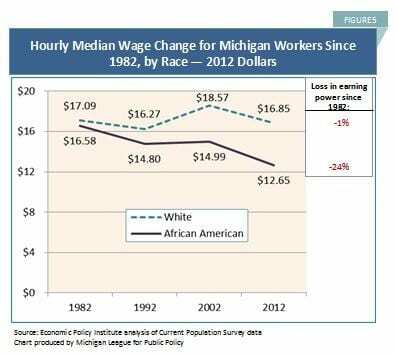 90% of Michigan Labor finds themselves making less and a further deterioration in earning power. The upper 10% of Labor has been able to maintain its earning power while the majority of Labor today makes less than what it did 30 years ago when adjusting for inflation. 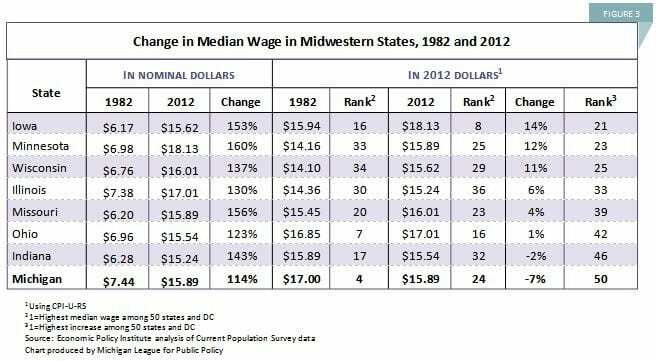 Median Wage workers making $15.89/hour in 2012 can purchase 7% less than Median Wage workers in 1982 while those workers in the 90th percentile has seen its purchasing power increase by 22% over the same period. 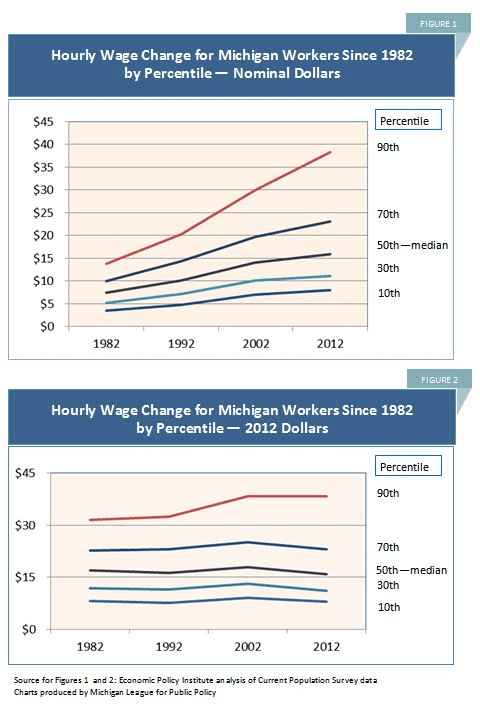 Having the 4th highest Median Wage in 1982, Michigan saw its Median Wage deteriorate to 24th after losing much of its manufacturing base through globalization and the skewing of productivity gains to Capital. In comparison to other states and six of eight Midwest states, Michigan saw a decrease of 7% in Median Wage while the other states (Wisconsin decreased 2%) increased Median Wage. In determining the significance of the drop from from 1982 to 2012, Michigan ranked 50th amongst the states and District of Columbia with Alaska at 51st (larger drop). 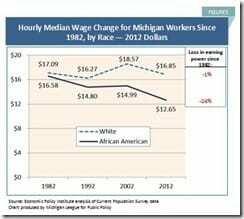 While overall Median Wage has decreased by 1% for Caucasian Labor, African Americans have seen a deterioration of Median Wages of 24% since 1982. During the Clinton era, it was said economic growth resulted in Labor seeing greater gains in wages. While this is true for Caucasians the gap between African American and Caucasian Labor. 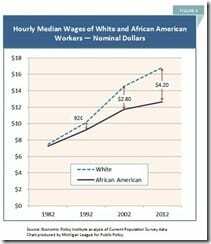 African American Labor did not experience the temporary growth in wages their Caucasian Labor counter parts did and remained flat. A difference in Labor Wages can also be found at the professional levels as well. 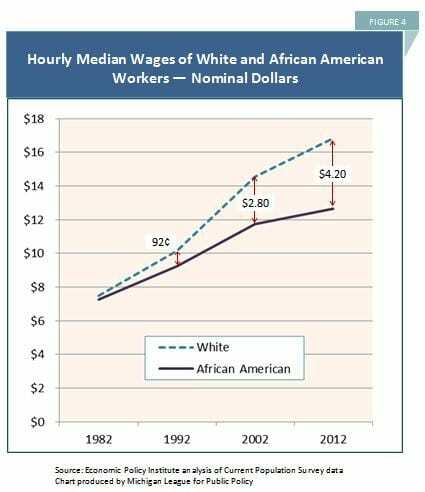 For example, a “$90,000 median wage for for whites and a $68,000 median wage exists for African Americans in selected majors such as Electrical Engineering.” While attaining a postsecondary credential can greatly increase earnings for African American workers, racial disparity will continue to exist.1” At the lower incomes the impact of education pays an even bigger factor in wages. The lack of a high school diploma is twice as high for African Americans as it is for Caucasians and the attainment of an Associates Degree is 40% higher for Caucasians as it is for African Americans. Tom Hertz in Understanding Mobility in America pointed to various factors impacting the upward mobility of people in America. Like Peter Ruark, Tom Hertz pointed to education and income being important factors as well as location or residence. By law segregation was eliminated in the sixties; yet, metropolitan Detroit remains one of the most segregated areas in the country today. Peter Ruark suggests a linkage between occupational and the residential segregation experienced in Detroit; “residential patterns that segregate black and white youth increase the likelihood that these whites will find better-paying jobs in overwhelmingly white occupations and that blacks will end up in lower-paying occupations filled mostly by other blacks.3” To which I would add, the flight of business and whites has been occurring since the sixties destroying the tax base of the city leaving little resource for the city to address many of the issues there. While formal segregation has ended in the US, SCOTUS blocked the city and the NAACP from seeking resolution to the segregation of schools (Milliken vs Bradley). Also in his conclusions, Hertz determines various factors limit the mobility of generations beyond that of income. The United States has one of the “lowest rates of intergenerational mobility among high-income nations, such that the chances of ending up rich if you were born to a low-income family are on the order of just one percent.2” Factors determining mobility include Education, Income, State in which you live, Health, female head of family, and Race of which Education is the most important factor. Even after controlling for the other factors in his study, Hertz determines Race plays a significant factor in upward mobility. Upward mobility for low and middle income Labor is difficult at best and even more so for African Americans when factors beyond income are considered. The PPACA and Healthcare Sky is Falling Again . . .
Huh? Repeal the PPACA to Help Hispanics and African-Americans ? ? ? Crooks and Liars carries a conversation by Repub Senator Ted Cruz with Candy Crowley on CNN. Senator Ted Cruz of Texas is making it his crusade to repeal the PPACA so as not to cause harm to the most vulnerable of America who potentially are losing their jobs, the Hispanics and African-Americans and singe moms. To real the PPACA do so, he is asking the House to pass a budget which specifically funds everything the government needs with the exception of funding for the PPACA. Factcheck.org has debunked the lost job claim here: GOPS’s ‘Job-Killing’ Whopper, Again and previously. 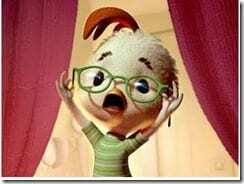 There is no basis for Senator Cruz’s claim for lost jobs due to the PPACA. As we’ve said before (a few times), experts project that the law will cause a small loss of low-wage jobs — and also some gains in better-paid jobs in the health care and insurance industries. It’s also expected that more workers will decide to retire earlier, or work fewer hours, when they no longer need employer-sponsored insurance and can obtain it on their own with help from federal subsidies. But that just means fewer people willing to work — and it will free up jobs for those who want them. If anything, that could reduce the jobless rate. Maybe Senator Cruz is implying employers will cut hours to less than 30 per week? Our own Spencer England has done a couple of posts on the topic of cutting hours to less than 30 hours. It just is not happening as the critics and naysayers are claiming. Obamacare, The Sequester and Part Time Employment and here: Obamacare and Employment. Is the PPACA hurting Hispanics and African Americans as Senator Cruz says? The US Department of Health Says No. 913,000 Latino have already benefited and 509,000 African-Americans to date. If anything, it appears that more of the minorities Mr. Cruz claims are being hurt are being helped by the PPACA. “Federal Healthcare Can Not Work” according to former Senator Jim DeMint who recently became the Heritage Pres . . .
Howard Dean: “I’m sure it won’t surprise you to know that I disagree with that,” Dean said before he was interrupted by Bash. CNN’s Bash: “I’m so shocked,” she snarked, promising to allow Dean to respond following a commercial break. Someone is blowing smoke up . . . well, ahhh again. While there are issues with people who just exceed 400% FPL getting subsidies, Rep Gohmert of Texas claim is erroneous. A person making $14,000 in income is at 122% of FPL and would be subsidy eligible. Under the PPACA, if a citizen lives in a state which expands Medicaid to 138% FPL, the person making $14,000 would be covered under it. If a citizen lives in a state “like Texas” which chooses to not expand Medicaid, the person would be exempt from the mandate or additional income tax as Gohmert claims. A rule published July 1st granted the exemption to the mandate or citizens who live in states which do not expand Medicaid. 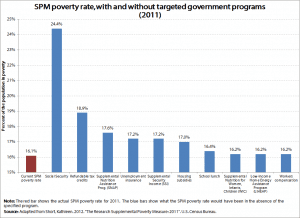 There is a lot of controversy about expanding Medicaid to cover people making less than 138% FPL in that the gov. could attach assets in the future. States do have that option and in fact they do enforce it when the middle class uses Medicaid to pay for assisted care and nursing home care which is nothing new and did not come about with the PPACA. Those wealthier than FPL must meet a certain income and asset standard before Medicaid will kick-in. 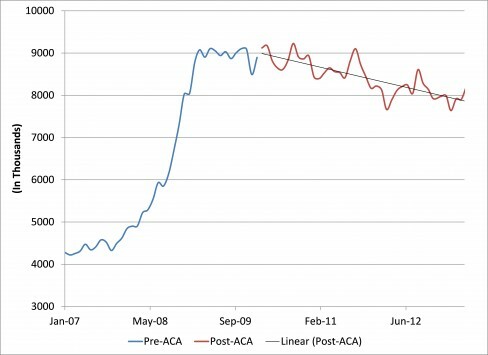 Since the PPACA was implemented, the numbers of part time workers has been decreasing. The numeric quoted represents the total number of part time workers seeking full time work. 74% of Small Business will fire workers, cut hours under Obamacare. Factcheck.org reports on how John Boehner misquoted a recent Chamber of Commerce release of a 3 page Small Business Outlook Study. Only 13% of small businesses said they would take such actions in the study. Even though some companies will cut workers to less than 30 hours to avoid providing them with healthcare insurance, the companies will still have to pay in equivalents. The government calculates something it calls full time equivalent employees. It divides the number of hours that part time workers actually work in a month ]by 120 to see what it is in equivalent. In effect, for purposes of the regulation two part time employees will count as one full time employee in determining if the firm has over 50 employees and is subject to the penalty. So actually, firms will not be able to avoid the penalty by just cutting the hours its employee work to under 30. As my Chicago friend Mike (doodahman) points out in Facebook, the City has just issued RFPs for additional Charter Schools. This comes after Chicago Public Schools closed 50 schools throughout the city causing students to travel farther and over crowding other schools. The Chicago Teachers Union sees it as a union busting tactic and predicted it as such as Charter School teachers can not be represented by the union (CTU). “Without fanfare, the district posted an official ‘request for proposals’ to its website Monday that invites charter schools to apply to open shop in what the school district has identified as priority neighborhoods—large swaths of the Southwest and Northwest sides. Those heavily Latino areas have struggled with overcrowded schools. The district wants what it’s calling ‘next generation’ charter schools, which could combine online and traditional teaching. It also wants proposals for arts integration charter schools and dual language charters. The Chicago Teachers Union and others have argued for years that school closures are about making way for charters and weakening the union. The ComCC membership consists of many of the well to do from the City who exercise their influence and power regardless of who is in office. The implications of which cause one to wonder what it means for the city and schools with all of this corporate power and influence used to shape both. The bottom line is still to enhance their profits at the expense of the people they claim to be attracting. Rahm I. Emanuel, Mayor, City of Chicago; William M. Daley, Chief of Staff, The White House; Lester Crown, Chairman, Henry Crown and Company [family wealth = $4.8 billion]; Kenneth C. Griffin, Founder and Chief Executive Officer, Citadel, LLC [wealth =$3.7 billion]; Tony W. Hunter, Chief Executive Officer, Tribune Publishing Company Valerie B. Jarrett, Senior Advisor to the President, White House; Paul V. La Schiazza, President – Illinois, AT&T Illinois; Timothy P. Maloney, Illinois President, Bank of America; J. B. Pritzker, Managing Partner, The Pritzker Group [wealth = $1.6 billion]; Penny Pritzker, President and Chief Executive Officer, Pritzker Realty Group, LP [wealth = $1.7 billion]; Thomas J. Pritzker, Chairman, Hyatt Hotels Corporation [wealth = $1.8 billion]; J. Christopher Reyes, Chairman, Reyes Holdings, LLC [wealth = $2 billion]; Michael D. Scimo, Managing Director, Chicago Office, Accenture; William Wrigley, Jr., Chief Executive Officer, Wrigley Management, Inc. [wealth = $2.2 billion], etc. "pensioners: 17 cents on the $; BoA, UBS 75 cents on the $"
Detroit Said to Reduce Swaps Debt by 25% in Deal With Banks . The swaps were a “bet” on the direction of interest rates. With the decline of variable interest rates, Detroit found itself owing to the banks. With the decreased credit rating to B2, the same as AIG, Detroit found itself at the mercy of the banks who demanded their money. Except, there was no President of Congress moving quickly with legislation to establish a fund like TARP did for AIG. Nor did the Fed establish the city as a Bank or buy up its municipals. Even the state of Michigan did little to help the cash strapped city. When the first Michigan Emergency Manager Act was struck down, the Republican dominated legislature reacted quickly, far quicker than voting on the expansion of Medicaid (one year has passed since SCOTUS ruled on the PPACA); but then, this is TBTF and business we are talking about and not ~ 450,000 constituents living with incomes less than FPL. With little delay, the legislature passed a new Emergency Manager Act, Public Act 436 giving derivatives such as the Interest Rate Swaps top priority similar to what the Federal 2005 Financial Services Modernization Act did. Public Act 436 goes as far as to supersede payments to pensioners and child support payments. (a) Conducting all aspects of the operations of the local government within the resources available according to the emergency manager’s revenue estimate. Besides awarding derivative holders and bank first in line status, the Republican State Legislature also took it upon themselves to make sure Public Act 436 can not be overturned through voter referendum. Governor Rick Snyder wasted no time in signing the bill. The winners in the Detroit crisis are the banks who have reaped $millions in fees, avoided property taxes on partially foreclosed properties (the foreclosures were never completed after driving the owners out of the houses and left the uninformed former mortgage holders on the hook for back taxes), and moved to the front of the line of Detroit debt holders. Typically these Interest Rate swaps are of the variable interest rate variety and are often exchanged for fixed rate through the Swaps. When the Fed drove down the variable interest rates, cities found themselves on the hook for the higher fixed rates. Many of the Swaps are also tied to the London Interbank Offered Rate (LIBOR) which was being manipulated by the largest banks. As a result, the banks owe little due to low variable rates and the cities are on the hook for higher fixed rate costs. Just a measly $1.4 billion of the $3.8 billion Interest Swaps tied to Detroit Pension Funds to which pensioners are being asked to accept far less than what banks are being asked to accept. The losers? Retirees who have pensions covered by the Interest Swaps. Workers who took and will take wage cuts. Detroit with thousands of partially foreclosed vacant houses which property taxes can not be collected on from the former owners or the banks. The state of Michigan; it will have a black eye for doing little to help the abandoned city over the decades. Without it and its trade with the US largest trading partner Canada, the state would be little more than a large vegetable farm. Banks may take a trim around the ears; but, it will not be anywhere as severe as the haircut the pensioners and workers will have taken when all is sorted out. EPI’s Elise Gould reports on the impact of Social Security as a safety net keeping another 25 million people out of poverty. State Run and Free Healthcare Clinics ? ? ? “For goodness sakes, of course the employees and the retirees like it, it’s free,” says Republican State Sen. Dave Lewis. – “If they’re taking money out of the hospital’s pocket, the hospital’s raising the price on other things to offset that,” Lewis suggests . . .
– He (Lewis) and others faulted then-Gov. Brian Schweitzer for moving ahead with the clinic last year without approval of the state legislature, although it was not needed. One year has passed and what about today’s feelings ? – “They’re wonderful people, they do a great job, but as a legislator, I wonder how in the heck we can pay for it very long,” Lewis says. (me)Someone changed his mind. – division manager Russ Hill says it’s actually costing the state $1,500,000 less for healthcare than before the clinic opened. (me) Sounds like it will fund itself in the end. – “Because there’s no markup, our cost per visit is lower than in a private fee-for-service environment,” Hill says. Some of this may not sit well with physicians; but, why the big difference ? ? ? – Physicians are paid by the hour, not by the number of procedures they prescribe like many in the private sector. The state is able to buy supplies at lower prices. – Bottom line: a patient’s visit to the employee health clinic costs the state about half what it would cost if that patient went to a private doctor. And because it’s free to patients, hundreds of people have come in who had not seen a doctor for at least two years. – Hill says the facility is catching a lot, including 600 people who have diabetes, 1,300 people with high cholesterol, 1,600 people with high blood pressure and 2,600 patients diagnosed as obese. Treating these conditions early could avoid heart attacks, amputations, or other expensive hospital visits down the line, saving the state more money. and lower costs over all in the end (me). – That personal attention has proved valuable for library technician Pamela Weitz. A mammogram late last year found a lump. “That doctor called me like three or four times, and I had like three letters from the clinic reminding me, ‘You can’t let this go, you’ve got to follow up on it,’ ” she says. This is what is meant by improved quality and better outcomes from healthcare as opposed to a services for fees scenario.The patients appear to be happier as well as the doctors employed by the state run clinic.